So many plays and musicals on the African American human condition during slavery in America have been written since The Color Purple made its thunderous debut 13 years ago. 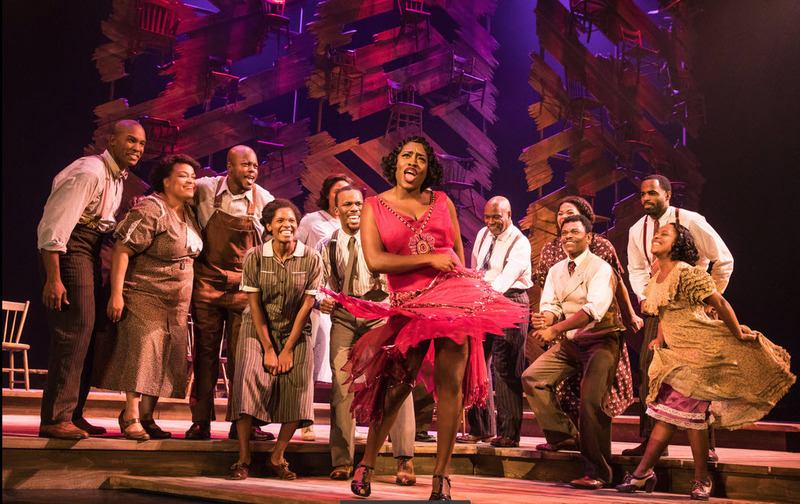 Based on Alice Walker’s Pulitzer Prize-winning book of the same name, the heartbreakingly poignant musical returned to Broadway in 2016 earning it a Tony Award for “Best Revival of a Musical”. And in 2017, against some mighty stiff competition, it garnered a Grammy Award for “Best Musical Theater Album”. The musical’s arrival at Kennedy Center last week showed audiences that a story of women fighting for their survival against the tyranny of sexism and racism still has relevance. Though set in the Deep South in 1909, after more than 100 years of oppression, we are still fighting against these very -isms with the rise of the #MeToo and #BlackLivesMatter movements. Director and Set Designer John Doyle utilizes a simple wooden backdrop hung with chairs to depict the harshness of the characters’ personal landscapes. 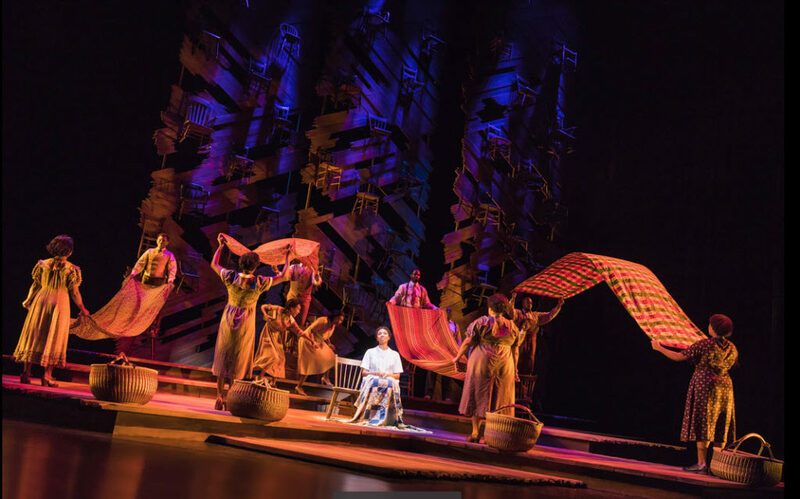 Using nothing more than those chairs and African woven baskets as props to tell the story of a young girl’s treacherous path to freedom and self-actualization, Doyle places these colorful and sympathetic characters into a tempestuous story featuring young Celie. Played exquisitely by Adrianna Hicks, Celie steals our hearts from the start with her love for her sister, Nettie, and the heartless abduction of her babies. 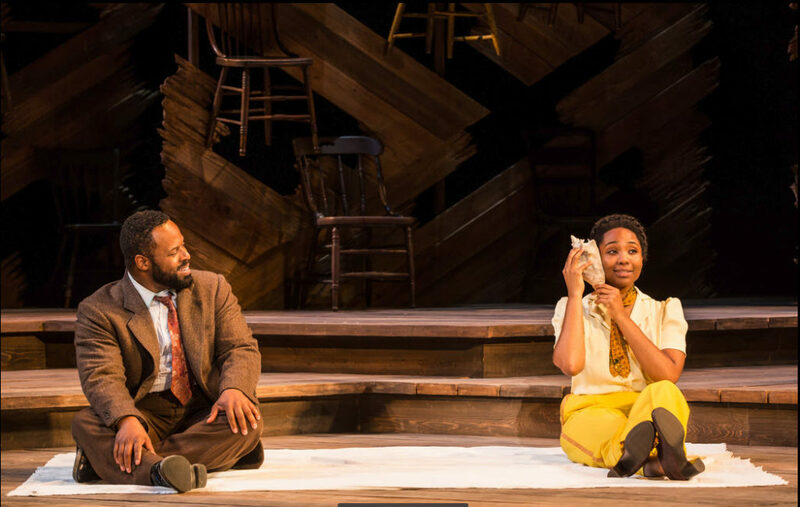 Gavin Gregory (Mister) and Adrianna Hicks (Celie) in the North American tour of THE COLOR PURPLE. Photo by Matthew Murphy, 2017. The show’s memorable songs by Allee Willis, Stephen Bray and Brenda Russell are sung by an excellent ensemble who present this complex crystallization of life-on-the-edge-of-nothing with Blues, Gospel and tender ballads intricately woven into this tender tapestry. “I’m Here” Celie’s redemptive ballad and the notable red hot mama number “Push Da Button” sung by Shug, are guaranteed to thrill audiences. The North American tour cast of THE COLOR PURPLE. Photo by Matthew Murphy, 2017. Starring Adrianna Hicks as Celie, Carla R. Stewart as Shug Avery, Carrie Compere as Sofia, N’Jameh Camara as Nettie, Gavin Gregory as Mister, Jay Donnell as Harpo, Mekhai Lee as Grady and Erica Durham as Squeak. With Darnell Abraham as Adam, Gabrielle Reid as Olivia, Amar Atkins as Guard, Kyle E. Baird as Bobby/Buster, Angela Birchett, Brit West and Bianca Horn as Church Lady, C. E. Smith as Preacher/Ol’ Mister and J. D. Webster as Pa.
Book by Marsha Norman, Associate Director Matt DiCarlo, Musical Director/Conductor Darryl Archibald, Costume Designer Ann Hould-Ward, Lighting by Jane Cox and Sound Design by Dan Moses Schreier.Through August 26th in the Eisenhower Theater at The Kennedy Center for the Performing Arts, 2700 F St., NW, Washington, DC. For tickets and information for future shows call 202 467-4600 or visit www.Kennedy-Center.org.